Spring Creek Garden began as one greenhouse and a small garden patch 35 kilometres north of Outlook, Saskatchewan. It has grown exponentially since its existence in the late eighties to become about a one hundred acre vegetable farm. Dan Erlandson had the advantage of growing up in the market gardening business. His mother, Natalie Erlandson, and Grandmother, Darlene Derdall, first had the idea of vegetable gardening. It then grew to be a family business, encompassing Natalie’s husband, Grant, as well. About 1994, Spring Creek Garden had grown to be approximately 60-70 acres. In the late nineties the garden was downsized because of other business ventures and eventually sat idle for a year before Dan took it over in 2001. 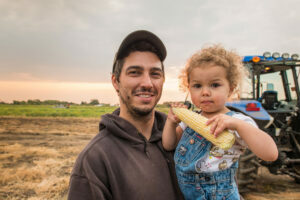 At the young age of 16, Dan was fortunate enough to have his family as mentors and was able to plant a modest amount of acres on the family land. Dan used the garden to fund his University degree in Agriculture Business and successfully turned his summer job into his post-university career. He married in 2010 and gradually began to introduce his new wife, Chelsea, into his market gardening business. In order to keep up to consumer demand, a new partner has been welcomed into the business, Dan’s brother Travis Erlandson. Spring Creek Garden has become a passion and a lifestyle for the family and in 2018, Spring Creek Garden will be planting approximately 225 acres of mixed vegetables, a few select fruits, and dabbling in greenhouse vegetables. Spring Creek Garden is focused on providing its consumers with a fresh and local product. 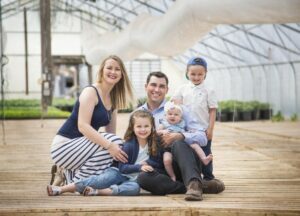 Dan, Chelsea, and Travis Erlandson are committed to sustainable agriculture and are passionate about helping people find local products easily. They want to be able to assist their consumers in providing a local product and marketing it through as many avenues as possible, whether it be farmers markets, commercial wholesaling, or CSA (Community Supported Agriculture). Spring Creek Garden are members of multiple Farmers Markets. Customers can find them six days a week in Saskatoon and two days a week in Regina. The goal at the farmers markets is to have a consistent supply of a wide variety of vegetables to create a one-stop shopping experience for customers. The produce supplied at market is harvested, washed, and packaged within 48 hours prior to being displayed and sold to provide customers with the freshest product possible. Spring Creek Garden expanded into commercial wholesaling in 2013 as a way to capitalize on potential growth. This enabled the garden to be able to provide local produce to a larger client base due to commercial retailers’ capabilities. This is very important because it coincides with their goal of supplying a larger population with fresh, local produce. This opportunity to promote local arose from a partnership between Prairie Fresh Food Corporation (PFFC), to which Spring Creek Garden is a shareholder, and The Grocery People at Federated Co-op. In order to be able to sell to TGP, Spring Creek Garden had to first become certified in the CanadaGAP program. CanadaGAP was designed by the Canadian Horticultural Council, reviewed by the Canadian Government and is expected by Commercial Retailers. 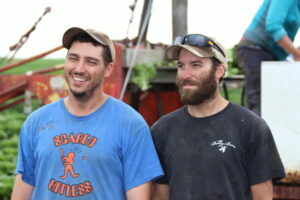 It is an on-farm food safety program. The process of becoming CanadaGAP certified has enabled Spring Creek Garden to refine production and handling practices, thus, providing clientele with a safe and traceable product.